You could tell from the tickets selling out way in advance that there was a lot of excitement around Mallrat’s biggest headlining tour yet. 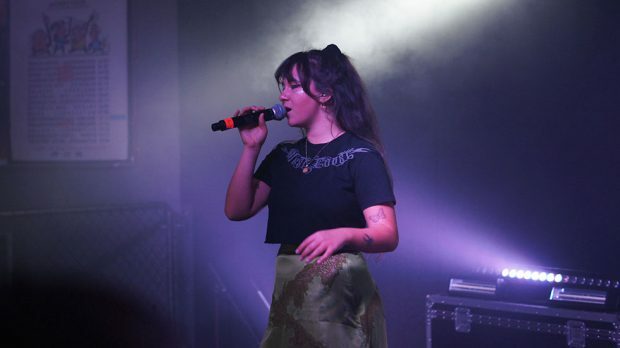 It’s been a big year already for Grace Shaw, the talented Brisbane singer and rapper known as Mallrat, still just 20 years of age. 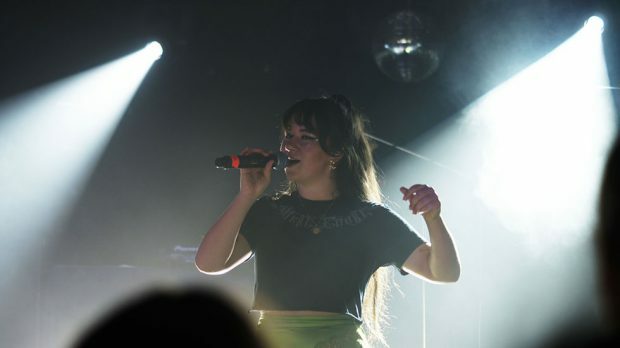 Her track Groceries came in at #7 in the Hottest 100, and and she toured with the Falls Festival, where her set attracted a huge, avid crowd – though as great as it was, it lacked impact due to poor sound. Tonight there would be no such issues, as she slayed the Rosemount main room to a horde of adoring fans that risked drowning her out as they sang along to every word. And she hasn’t even released an album yet. Kicking the night off with a bang, or maybe more a pop, was another similarly styled young female artist on the rise, Kota Banks. 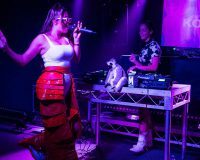 More flamboyant and overtly poppy than Mallrat, Kota worked the stage in some pretty wild red ruffly vinyl pants and a white bodysuit. 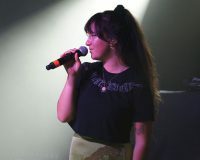 The Italian-Australian, raised between Sydney and Florence, has been singing since she was little and has a real confidence on stage. 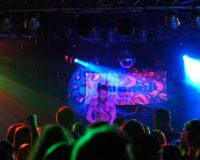 Backed by her DJ, they warmed up the room, which was already getting packed. Both the artists and crowd tonight were all very young, giving a glimpse into a thriving youth scene with it’s own sound and style. 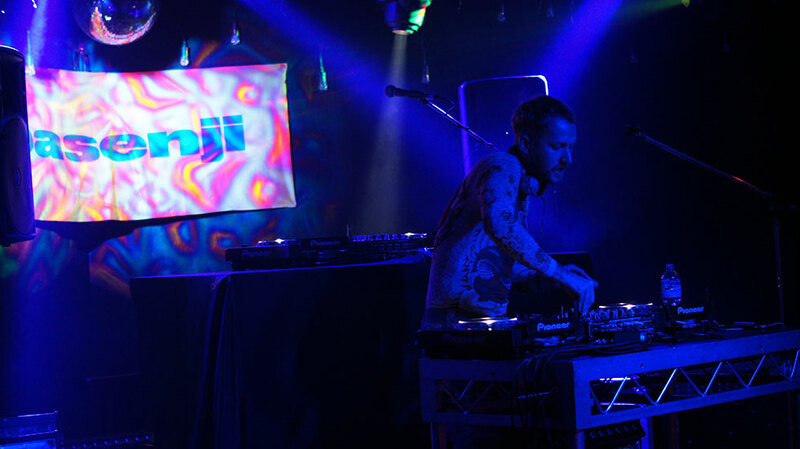 Basenji was next and took things to the next level with a more upfront dance sound. 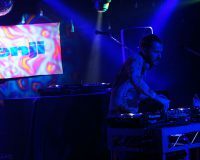 The pulsing electro beats energised the room, and the old-school psychedelic rave lighting was cool. Fresh off the success of Nobody’s Home which he produced for Mallrat, Basenji is another young name to watch in the scene, having also produced for Tkay Maidza. As well as his own tracks, he remixed familiar tunes, dropping in samples like the heavenly vocals of Jeff Buckley from Mojo Pin over a house beat to nice effect. As Basenji left the stage, the sold out crowd really started to pack the room and surge forwards. The excitement and anticipation was tangible. 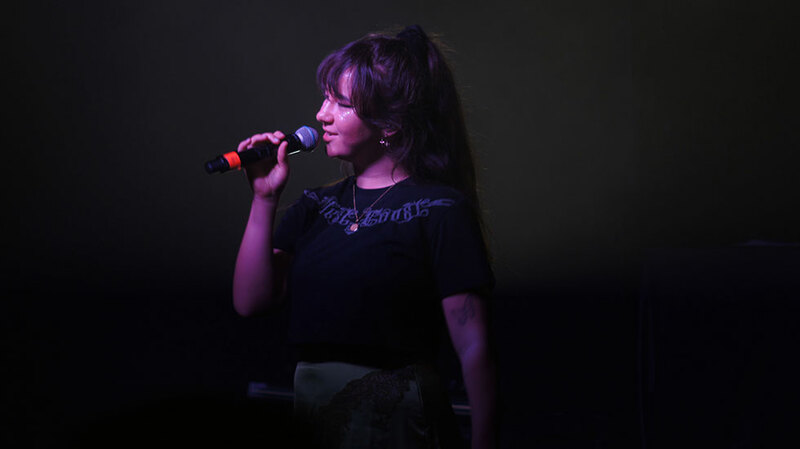 While she’d toured a fair bit in the last year or so, this gig really felt like a special one for her, and for the fans – she’s really come into her own, and has a decent repertoire now. 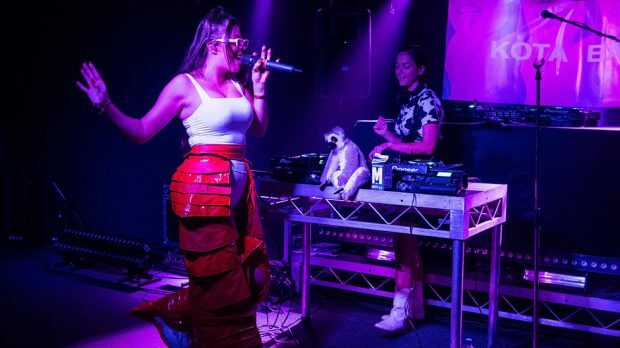 DJ Denim took the stage to drop a few beats briefly and build the vibe even more, before Mallrat herself joined her, dressed fairly plainly but with an infectious smile plastered on her face as she was greeted like a rock star. 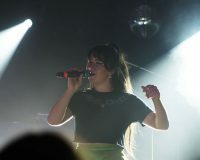 She launched into it with Tokyo Drift, a track off her first release Uninvited from 2016. Her stage presence is understated, slowly moving around the stage, focussed on her vocals, mic clasped between her hands. Her voice has a unique sweetness, innocence and realness to it, with a tight, melodic quality and phrasing that sits between singing and rapping. She seemed to be enjoying herself as much as the crowd, who gave her a huge response after each track. “This next song is one of the first songs I wrote and it’s called Sunglasses,” she said ahead of the first track that got her attention with it’s lo-fi video and nursery rhyme sing-songy sound, like a less developed Lana Del Rey. It’s fun, but she has definitely developed over the last few years. Moving on to more recent material, things started to heat up, and you really had that feeling of seeing of an artist who is about to blow up. The dominantly female crowd sang along to every word of Texas – at times drowning out her fragile, affected voice. 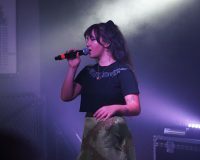 An original, unique Australian talent with huge potential – she’s only really limited by her repertoire and slightly samey vibe between songs. The live show is developing, and if gets more opportunity to travel and work with some high calibre international producers, it could really advance her sound. 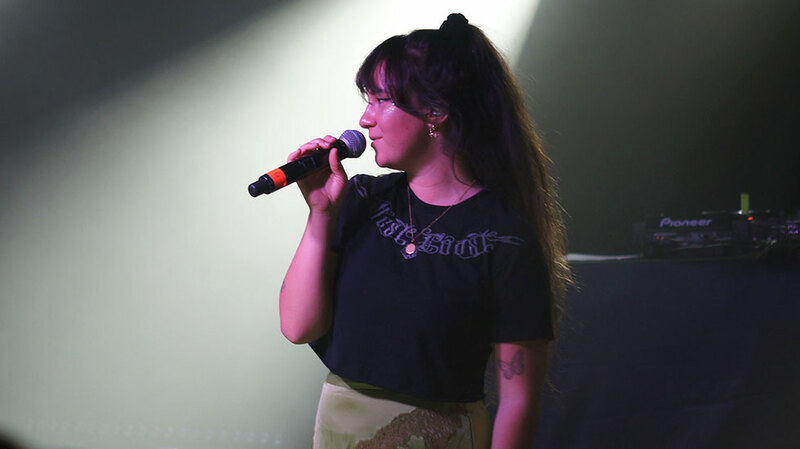 Mallrat is obvious a role model and inspiration for young girls, and it’s great to see a pop star who doesn’t fit the mould. She doesn’t rely on skimpy outfits or raunchy dancing to get attention – she just writes and sings great songs with real sincerity, that people emotionally connect to, and has a strength and independence that shines through. 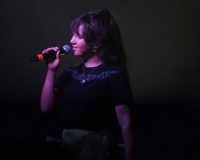 Bringing a nice mix to the sound, she introduced an acoustic guitarist, and much to the crowd’s delight and surprise, launched into a great cover of girl-of-the-moment Billie Eilish’s Bellyache. 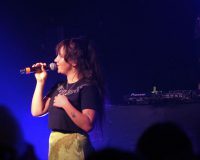 Her own track Better got a huge reaction with its soaring, euphoric chorus – the love and adoration from the crowd was almost overwhelming at times, as Mallrat acknowledged herself. U.F.O. 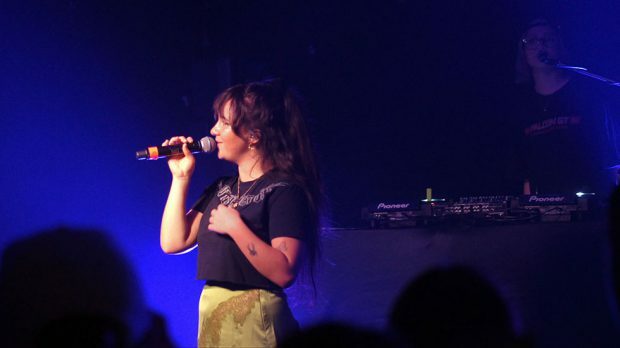 which features a verse from Allday (a big inspiration for Mallrat), is one of her best tracks and a big one live thanks to its heavier, darker sound. 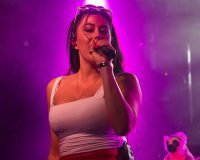 She started backed just by the acoustic guitar, before DJ Denim dropped the trappy beat and driving synth which got the crowd jumping and saw a million phones out. Then she announced she only had three more songs to go. “I wish I could play for longer but I haven’t got any more songs! I’ve got some on my computer… that are almost finished. Thanks for voting for this one though,” came the intro to Groceries inciting massive cheers. A definite highlight, it sounded so much better than Falls where she attempted it in a giant tent acoustically with not enough volume. This time, it felt like the song reached its live potential, with the guitar and beat fattened up a bit. It’s a deceptively simple, beautiful song, with some nicely penned, heart-on-sleeve lyrics, like the wonderfully rhymed, “Heart broke, but I spend it, ’cause I’m Miss Independent”. Nobody’s Home sounded bigger and better live, with layered, looping vocals at the end, before she finished with a bit of a banger, the title track from her first EP, Uninvited. But the crowd wouldn’t let her go. They wanted more. As she had played pretty much everything she has, she dug deep and produced gold with a surprising, well-chosen acoustic cover of the incredibly beautiful 1993 Mazzy Star classic Fade Into You. It was a great version that suited her voice well. There’s been some buzz around her for a while, and it is well deserved – the fans obviously know she’s special, and the rest of the country and world are catching on. Her sound and style is all her own, and her talent and potential is even more evident in a smaller gig like this. This night, we witnessed an artist coming into their own. With this much excitement already, and the promise of a debut album to come, if she can continue this trajectory Mallrat is poised on the cusp of greatness.